Pedersen, Anne-marie. "Helen Mamayaok Maksagak". The Canadian Encyclopedia, 15 October 2018, Historica Canada. https://www.thecanadianencyclopedia.ca/en/article/helen-mamayaok-maksagak. Accessed 21 April 2019. Helen Mamayaok Maksagak, CM, politician, public servant, community leader (born 15 April 1931 in Bernard Harbour, NT [NU]; died 23 January 2009 in Cambridge Bay, NU). Maksagak was the first woman and Inuk to serve as the commissioner of the Northwest Territories. A vocal and engaged advocate for Inuit affairs, she contributed to efforts to establish Nunavut as Canada’s third territory in the 1990s. In March of 1999, she was chosen as the first commissioner of the newly created Nunavut territory; her term lasted until March 2000. 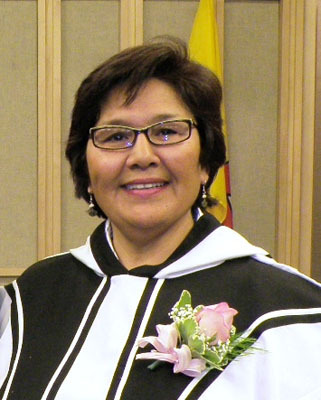 Maksagak returned to a formal political role in November 2005, when she was appointed deputy commissioner of Nunavut. In addition to her political career, Maksagak performed advocacy work, focusing on Inuit and, more broadly, Indigenous initiatives, such as improving access to social services. Helen Mamayaok Maksagak, of Inuvialuit descent, was born in the spring of 1931 in Bernard Harbour, between Victoria Island	and the mainland Northwest Territories — a region that would eventually become part of Nunavut. She spent her childhood in Tuktoyaktuk and Aklavik in the Northwest Territories. Maksagak also completed her education there, graduating from grade eight before transitioning to a community service role, where she advocated for environmental protections and family services. She married John Maksagak in 1950. The couple lived in Tuktoyaktuk and started a family. In 1961 they moved toCambridge Bay, where they raised six children and established their home as a refuge for victims of domestic violence. Prior to her tenure as a public servant in 1992, Maksagak held various community and advocacy positions throughout the 1960s and 1970s. For example, she was employed by the Royal Canadian Mounted Police	and managed an outreach centre. Maksagak went on to complete service work for various committees, including the Northwest Territories Round Table on the Environment, the Canada Committee for the International Year of the Family, the Social Assistance Appeal Committee, the Housing Association Board, and the Drug and Alcohol Board. 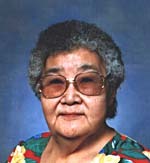 Helen Mamayaok Maksagak became deputy commissioner of the Northwest Territories in 1992, serving in this role until 1994. She went on to act as the commissioner of the Northwest Territories until 1999, and in March of the same year she was selected as the commissioner of Nunavut — Canada’s newest territory. She held this position until March 2000, at which time she left this role, but continued to advocate for the rights of Inuit people, serving on various committees and remaining an active voice for her people. During the duration of her political career and advocacy work, public policy and legislative reform in the Arctic focused on autonomy and self-reliance for the Inuit at the community and regional levels. (See alsoIndigenous Self-government in Canada.) After leaving her position as commissioner, Maksagak served on the Nunavut Status of Women Council from 2001 until 2003, and as an elder on the Board of Directors for the Aboriginal Healing Foundation from 2004 to 2008. She returned to a formal political role in November 2005, when she was appointed deputy commissioner of Nunavut. 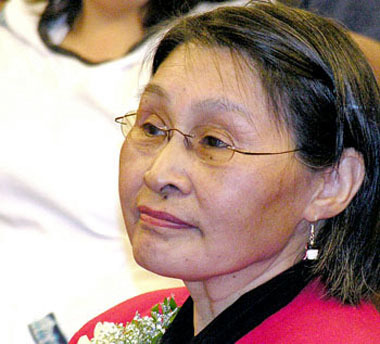 When she left office, Adrienne Clarkson, who was governor general of Canada at the time, said that Maksagak would be remembered for her enormous contributions to the people of the Arctic and the history of Canada. Honorary Doctor of Law, University College of Cape Breton (now Cape Breton University), Nova Scotia	(2000). Member of the Order of Canada (2002).